Helsinki, Finland: In 1994, Helsinki Water opened the Viikinmä wastewater processing plant, one of Finland's most significant environmental projects. The plant treats waste water, exploits gases released by the process to generates its own heat and electricity, and finally composts the sludge to produce new soil. 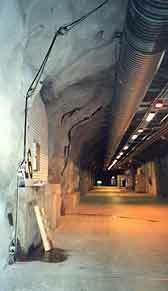 Most of the plant is housed in an underground grid of tunnels that were excavated from rock. The plant represents a significant investment and is quite important to Helsinki's future. Thus when permits were granted for construction of a residential housing complex nearby, Helsinki Water needed assurance that the drilling and blasting associated with the construction project would not damage the tunnels. For this reason, Helsinki Water decided to install a Bassett Convergence System (BCS) to monitor an access tunnel that is closest to the initial construction activity. 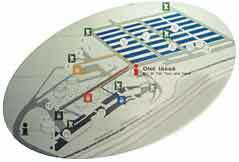 The system is mounted on the tunnel lining, which is 6 meters high and 8 meters wide. Readings are recorded by a CR10X data logger and transmitted by modem to a computer that runs BCSWin and MultiMon software. The system was installed and commissioned in three days by Juergen Kienle of Interfels and Alan Jones of Slope Indicator. If significant movements are detected during the initial phase of the construction project, Helsinki Water plans to move the system to other locations, as the project proceeds. Thanks to Alan Jones and Juergen Kienle for providing this story and to others involved in the project, including Helsinki Water, Mauri Hintsala of GEOTEK OY and Aku Turunen of Miranet.